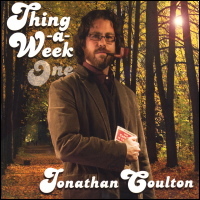 In the first year after Jonathan Coulton quit his software job to try to make a living as a musician, he recorded and released a new (free) song every week, sometimes trying experiments like letting his fans submit their own solos. The songs were later collected in a series of four CDs and sold as downloads. This page used to contain an excerpt from Fans, Friends & Followers, but I am now giving away the complete downloadable PDF of the book for free. Yes, free. See this page to get it.